Rails are worn out on top due to abrasion of the rolling wheels over them. The heavy wheel loads are concentrated on very small areas. Due to slipping action of wheels during starting and when brakes are applied to the moving trains, the metal of top of rail burns. 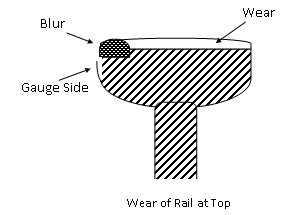 This wear of rails takes place at the ends of rails and is found to be very much greater than the wear at the top of rails. At the expansion gap, the wheels of the vehicle have to take a jump and during this jump, they impart a blow is the ends of the rails. 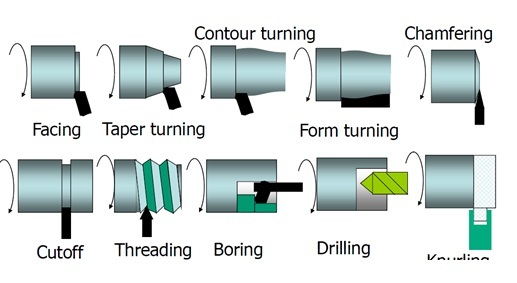 This blow is the main cause of wear of rails at ends. 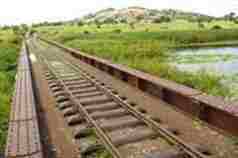 Due to successive blows, the ends of the rails are battered. Due to centrifugal force along the curvature, the grinding action of wheel flanges on the inner side of the head of the rails is caused. The vehicles do not bend to the shape of the curvature while moving over a curve. This results into the biting of the inner side of the head of outer rail by wheel flanges. The wear on the inner side of the head of inner rail is mainly due to the slipping action of wheel on curve. 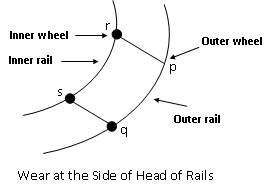 Outer wheels have to cover a longer distance than inner wheel as “pq” is greater than “rs”. But due to rigid connection between two wheels, they cover the same distance and hence then inner wheel slips over the inner rail, resulting in the wear of inner side of head of inner rail.